Like I mentioned before, I love Estée Lauder lipsticks. I had no idea how great they were until a few months ago. Recently they launched their new Pure Color Love Lipsticks and they are fantastic. I love the huge colour selection; all 30 of them. It comes in matte, shimmer, chromes, and cremes. The best way to wear the chrome lipstick is you pair it up with another lipstick like a matte or a chrome as the base. This will easily transform your lips from day to evening look. I really like the shape of the tip of the lipstick. It reminds me of a plaster spatula because the slant is on both side of the lipstick. This makes it so much easier to apply your lipstick and you don't need to use a lip pencil since the tip can act as one. I was also really surprise the staying power this lipstick has. It almost acts like a stain. Usually my lipstick will be gone after I eat or drink. When I look at my lips to reapply my lipstick there is still colour on it. This alone made me a huge fan of Estée Lauder Pure Color Love Lipstick (3.5g/$28). This giveaway will run from October 11th to November 8th, 2017 (midnight EST). Winner, You have 72 hours to reply. You must be 18+ Open to Canadians only. Good Luck! Psst - Can't win if you don't answer the mandatory question. I am not responsible for shipping and handling or damages of the prize. The prize is shipped by the Sponsor and they may substitute the prize depending what is in stock. Your information will be sent to the Sponsor for the purpose of shipping out the prize. I'm from Ontario and I would also love the Pure White Linen Light Breeze perfume!! I'm from Ontario and I would love to try any product from the Victoria Beckham collection. I am from BC and would also love to try the The Essential Face Palette - looks amazing, and would be all I would need for travelling! I'm from Ontario and I would like to try Pure Color Envy Lash Mascara. I am in Alberta. I would like to try the Modern Muse Eau de Parfum Spray. I live in NB and the The Essential Face Palette appeals to me. I am in Alberta. I want to try the UVA defense cream as looking for sunscreen that wear well with my makeup. I'm in Ontario and I'd try the NightWear Plus Night Detox Creme. I'd like to try the Double Wear Stay In Place foundation. I'm from Ontario. Another product I'd like to try is the Sumptuous Extreme Lash Multiplying Volume Mascara. Hi,i am in Newfoundland and another Estée Lauder product i would like to try is the Pure White Linen Light Breeze perfume!! I'm in Nova Scotia and I would love to try the Double Wear Stay In Place Flawless Wear Concealer. I'm from Manitoba and I would like to try out the Advanced Night Repair Eye Concentrate Matrix. I am from NL and I would love to try the Perfectly Clean Fresh Balancing Lotion. I'm from Ontario! I would love to try the Modern Muse Eau de Parfum Spray. I am in Ontario. I would love to try a new perfume, so I'd like to try the Pure White Linen Light Breeze perfume. Thanks for the chance. Much appreciated. Hi from Willow Grove, New Brunswick. I would love to try their Private Collection Tuberose Gardenia fragrance. In fact, I am putting it on my Christmas list. Thanks for the super giveaway opportunity! I'm from Ontario and would like to try the advanced night repair. Moisture Relief Creme. I have dry irritated skin and this might help to relieve this. In ON & I'd love to try Advanced Night Repair Eye Serum! I would love the Pure White Linen Light Breeze perfume!! I am from Ontario. I'd love Advanced Night Repair Eye Concentrate Matrix. NS- Would like to try Modern Muse perfume spray. BC I would like to try the Night Repair Synchronized Recovery Complex II. I'm from NS and I like the smell of the Pure White Linen Light Breeze perfume. Manitoba. I'd like to the the Advance Night Repair for both the face and eyes. I would like to try the Modern Muse Eau de Parfum. I'm in Ontario & I'd love to try the Stay-in-Place High Cover Concealer! I am from Alberta. I would like to try the Aerin Mediterranean Honeysuckle fragrance. I'm from Ontario. I'd like to try the Dark Spot Correcting Night Serum. I am from Ontario and I'd like to try their Idealist Pore Minimizing Skin Refinisher. I'd love to find something that would help fade scaring, but I'm not sure which of their products would be best for that. Radiant Vitality 2-in-1 Foam Cleanser! I'm in BC and I think the Advanced Night Repair Eye Concentrate Matrix is something I would love to try too. 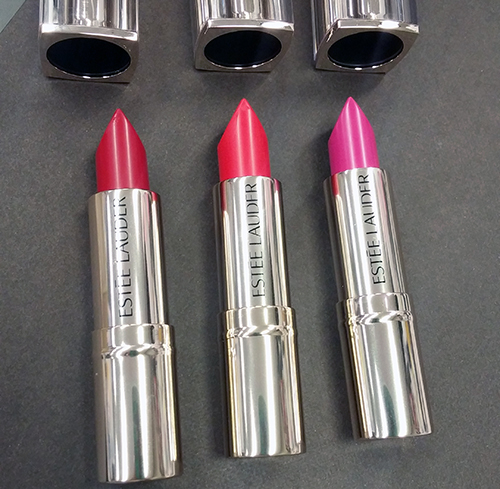 I live in Montreal and i would love to try these lipsticks. I live in Sk. and would like to try the Resilience Lift Night moisturizer. I am from Manitoba. I would also love the Victoria Beckham Estee Lauder Morning Aura Illuminating Creme. I'm from Ontario and I'd love to try the Stay-in-Place High Cover Concealer! I am from BC. I would love to try the Pure Color Envy. I'm in Ontario and I LOVE the LIMITED EDITION The Essential Face Palette. It's just beautiful ! from ontario and would love to try Linen Rose Eau de Cologne. Im from ontario and would like to try double wear foundation. Featuring a Full-Size Advanced Night Repair! I am from Ontario and I also would love Estee Lauder's Sumptuous Infinite Daring Length and Volume Mascara. I would like to try their White Linen perfume.